A test X-Drive Endure sail on the Reichel Pugh 77 JELIK. The Endumax filaments are white. New sails are expensive. A new experimental sail can be even more expensive if it fails to perform as predicted and you find yourself having to replace it sooner than you’d hoped. Some sailmakers test their new sail concepts on their customers’ boats—some without the customers knowing they are a Guenia pig; but UK Sailmakers doesn’t. We test our new sail concepts on boats belonging to our loft owners so we take the risk and put the money where our mouths are. Take for instance Frank Pong, the owner of UK Sailmakers Hong Kong. Frank is a passionate sailor who owns a fleet of racing and cruising boats. 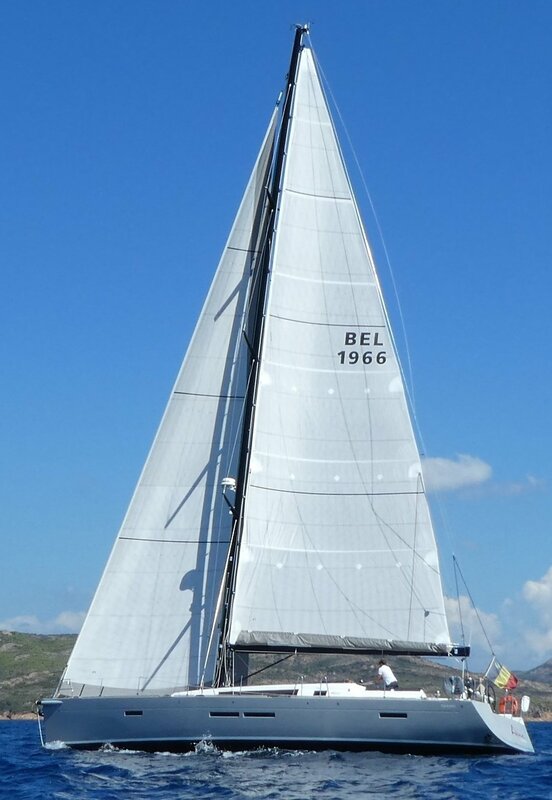 The boat he has raced the hardest for over a decade is a Reichel/Pugh 77 named JELIK, formerly one of Roy Disney’s PYEWACKETs. JELIK gets used for a lot of new product testing because she’s one of “our” boats, plus the loads on her sails are huge; therefore, if it works for JELIK it will work for you! For example, the luff length of her square top main is over 90 feet and the foot is over 30 feet. Talk about a need for load-bearing sails like UK’s Uni-Titanium. In fact, the first Uni-Titanium sail UK Sailmakers ever built was a jib for JELIK, which was so over built that it ripped the genoa lead car off JELIK’s deck. It was good to learn that on Frank’s boat instead of your boat. The latest sail to be tested on JELIK is the recently introduced X-Drive Endure. If a performance cruising product can hold its shape on a massive racing boat, just image how will it will do on your boat. Throughout UK Sailmakers’ tests of Endure, we used boats 50-feet and bigger in order to find out if the Endumax filaments are strong enough. Big boats have higher loads that exploit any weaknesses quickly. 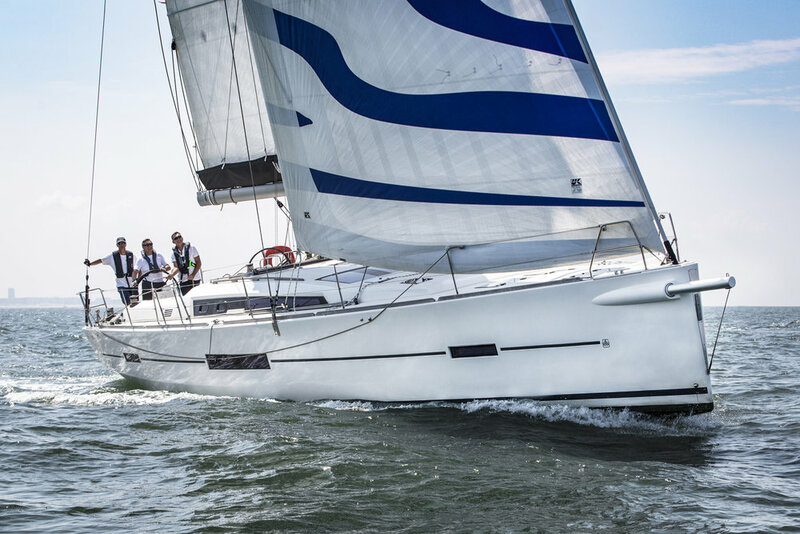 Another test platform for Endumax is UK Sailmakers Fremantle’s Jeff Bishop’s King 40 CHECKMATE. Geoff races his boat in the windy waters off the west coast of Australia. When he ordered a new Jib Top for his boat, instead of making an X-Drive carbon sail, he built an X-Drive Endure sail so that the group could get more data on how Endumax stands up. Jib Tops are only used for heavy air reaching, so the Endumax filaments will get put through their paces. Endumax tests nearly as well as carbon in strength, which means cruising sails can be made with the same performance as racing sails while having a clean classic white appearance plus the Endurance that is required for successful cruising and shorthanded sailing.For more information about X-Drive Endure — UK Sailmakers new performance cruising sails — click on this link. A set of X-Drive Endure sails on a Dufour 50. Two different pictures of the Wauquiez Centurion 57 ALICE with a set of X-Drive Endure sails. On the left, the sails are back lit, which shows off the Endumax filaments. The photo on the right shows how white the sails appear.